Peterborough Phantoms’ immediate future is likely to become clearer in the coming days. Owner Dave Lane and director of hockey Jon Kynaston will represent the city club at a National Ice Hockey League (South) meeting this Sunday (May 7) at which plans for 2017/18 will be thrashed out. Phantoms have applied to join that league following the collapse of the Premier Ice Hockey League, which was set to be a re-branded version of the English Premier League. That has led to more than a fortnight of uncertainly and coach Slava Koulikov, who still has two more years on his Phantoms contract, admits it has been a case of playing a waiting game. Koulikov said: “I went on holiday in April with a really clear picture of the roster I was building, but things then changed massively while I was away. “It is just a waiting game at the moment. We’re hearing lots of rumours and speculation, but there is nothing set in stone. 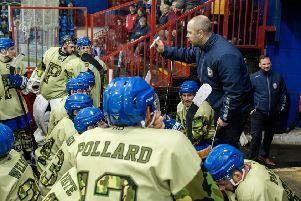 Phantoms are assured of a place in Division One of the NIHL due to the Peterborough Islanders, who are now coming under their banner, winning the Division Two (East) title last season. It’s thought that Phantoms will now take that place in Division One with the old Islanders side continuing in Division Two (East). NIHL rules permit clubs to sign two imports, but both cannot be on the ice at the same time. Phantoms have so far confirmed the signings of two players - captain James Ferrara and exciting forward Owen Griffiths - for next season. Those deals were announced before the league situation came to light.